Janet has been with the Widener Delaware Law School Library for 25 years beginning her career as a cataloger. Now, she is one of the go-to people in the Library and consistently delivers excellent results. She projects a calm, confident manner adding to her problem-solving expertise. She is always willing to help a faculty member with an involved research project and edits all of the law school faculty publications on Legal Studies Research Papers (SSRN). Hidden beneath that quiet exterior is a globe-trotting spirit that has visited many places in the United States and Europe. She enjoys being outdoors and is in several hiking groups. She also enjoys going to plays locally, in Philadelphia & in New York and has recently become a volunteer usher for the Grand Opera House & the Playhouse in Wilmington. 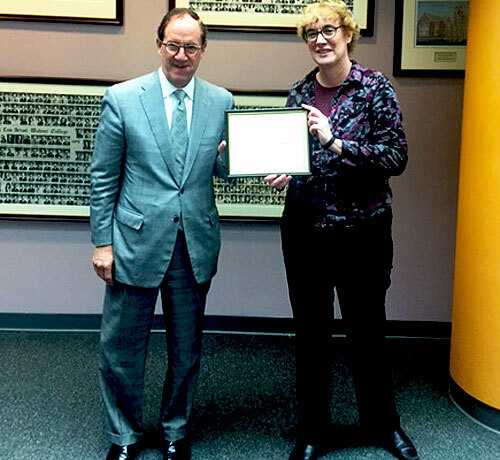 Picture: Dean Rodney Smolla presents the Employee Appreciation Award to Janet Lindenmuth.